Many modern tarot decks associate the transition from caterpillar-to-moth with the idea of the Death card. We are in the sun sign of Scorpio (October 23 – November 22). 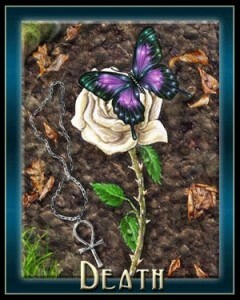 Scorpio is represented by the Death card in the Tarot (Major Arcana, #13)*. Many people, unfamiliar with the deck, truly fear this card (along with the Devil and Tower). When this card shows up in a reading, I gently explain that Death is merely a transition, a change that can’t (and shouldn’t) be avoided. During the time of Scorpio, you may find yourself going through transition, change, and even grief within the process. Watch this video on the Death card. Death is an important ending that initiates great change. You will go through what can’t be avoided and must remember that you have to clear out the old to make way for the new. Death needn’t lean toward the negative. The change indicated by this card can allow you to leave the past behind and open up to new opportunities and transformation of your current situation. You may be constantly dealing with change, but you are built for it. Death is the descent to the bottom before you climb back into the light, transformed, on the Wheel of Life. When the negative side of the card is felt, the Scorpio may have an extreme fear of death or have to deal with an unusual amount of change or loss. You must remember that change is needed for progression and evolution; therefore, you should prevent yourself from creating (or allowing) obstacles which impede your forward movement. astrology, death, Personalities of the Tarot, Scorpio, tarot, transition. Bookmark. Breaking News: We’re All the Same!